116 published items with the word (s) or phrase Kenneth Cole in News, Trends, Videos, Photo galleries, Agenda and sorted by "date descending". AllSisters, the Spanish swimwear brand, has inked a distribution deal with Victoria’s Secret. The label’s designs will be available on the Victoria’s Secret online shop throughout the summer season. Watch company Timex has named Paul Martin as its new managing director in the UK, overseeing the distribution and marketing of all Timex and Luxury Division brands including Ted Baker, Guess and Versace. Kenneth Cole is flying the flag for gender neutral fragrances with a brand new perfume collection. Rick Darling has been named Global Brands Group Holding Ltd.'s new chief executive officer and executive director, replacing Bruce Rockowitz. First shoes, now accessories. Karen Millen has signed its latest licensing deal, this time linking with Global Brands Group as it seeks more leathergoods sales outside of its own retail channels. The brand group announced on Wednesday that it has entered into an agreement to acquire the majority of the North American licensing business, which has a portfolio including Disney, Calvin Klein and Under Armour. Geneva Watch Group has partnered with Timex to distribute the Kenneth Cole New York, Reaction and Unlisted brand watches in Canada. ... en direct ou avec des licences un large éventail de marques avec Juicy couture, Calvin Klein, Ellen Tracy, Frye, Kenneth Cole ou encore Katy Perry, Allsaints, Kate Spade et JLO. ...Kenneth Cole a signé un contrat de licence pour quatre ans avec le groupe britannique GBG Europe Footwear and Accessories Limited, sur ses lignes de chaussures et de sacs à main. ...supervisera chez Delta Galil la production, le design et les activités de vente des licences Lacoste, Original Penguin, Kenneth Cole, Columbia ou encore Body Up. ...marcas en su portfolio, ya sea de forma directa o con licencia, como Juicy couture, Calvin Klein, Ellen Tracy, Frye, Kenneth Cole, Katy Perry, Allsaints, Kate Spade y JLO. ...paso por la escuela americana Parsons School of Design, el diseñador ha trabajado, entre otros, para Ralph Lauren y Kenneth Cole. ..., veterano dell'industria della moda dall'alto delle sue esperienze lavorative presso Porsche Design, Elie Saab e Kenneth Cole, è diventato il nuovo direttore creativo di Reebok. ...in der Kaltstahlhalle sein. Neben den Bodelshausenern sind dort auf 1.900 Quadratmetern u.a. auch Calvin Klein und Kenneth Cole angesiedelt. ...machte seinen Abschluss bei der amerikanischen Parsons School of Design und hat unter anderem für Ralph Lauren und Kenneth Cole gearbeitet. ...Kenneth Cole is building upon the success of his signature 'Kenneth Cole Black' fragrance with the launch of a new scent -- 'Black Bold'. ...Нью-Йорке в феврале. +Модельер, получивший образование в знаменитой школе Parsons, работал также для Ralph Lauren и Kenneth Cole. ...Outlet se encuentran: Calvin Klein, United Colors of Benetton, Pull & Bear, Zippo, Hugo Boss, Diesel, Dolce & Gabbana, Kenneth Cole, Michael Kors, Banana Republic, Swarovski, entre otras. ...portfolio, either as licensed or directly operated brands, labels like Juicy Couture, Calvin Klein, Ellen Tracy, Frye, Kenneth Cole, Katy Perry, AllSaints, Kate Spade and JLO. ...and continue to delight and engage with our consumers.”Last year, Timex signed a licensing deal for Ted Baker and Kenneth Cole and became a distributor for Ingersoll watches in the US. ...Kenneth Cole is flying the flag for gender neutral fragrances with a brand new perfume collection. ...Kenneth Cole has entered into a four-year licensing deal with UK-based GBG Europe Footwear and Accessories Limited to distribute men's and women's footwear, and manufacture and distribute women's handbags in EMEA. ...Price will be tasked with supervising production, design and licensing sales activities for Lacoste, Original Penguin, Kenneth Cole, Columbia and Body Up. 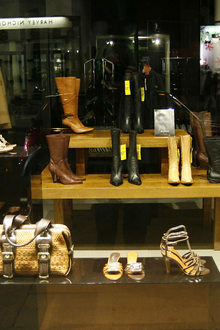 ...Kenneth Cole opened on Monday the brand's first Canadian free-standing store in Toronto, at 315 Queen St. West. ...​The US clothing brand Kenneth Cole has switched its South Asian partner from Reliance Brands to Brandzstorm India and will open ten new flagship stores by 2020. ...Kenneth Cole has launched its first fragrance masterbrand in fifteen years in the form of a new customizable fragrance duo of Kenneth Cole for Him and Kenneth Cole for Her accompanied by three personalization scents. ...mercado mexicano, el fabricante y distribuidor de relojes ha sumado a su portfolio 60 estilos de la marca estadounidense Kenneth Cole Watches para hombre y mujer.